2 Heat 2 teaspoons oil in the wok and add chicken, stir-fry until browned and cooked through. Add cashew nuts and stir-fry for 1 minute or until lightly toasted. 3 Add snow peas and cook for another minute. Add combined Recipe Base and water and heat until sauce thickens. 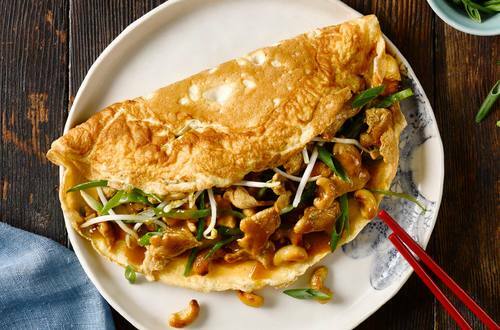 4 Fill omelette with chicken stir fry and top with spring onions and bean sprouts.